This project includes a glare screen on the walls south of the underpass and two murals on the walls north of the underpass. All of the work is complementary, and when taken together creates a holistic pattern concept for the site that is emblematic of Vail. Curvilinear forms, inspired by slalom curves, are both unpredictable and classical, creating a mark making system that suggests time and motion. The geologic layering, rock outcroppings, and tree lines create interest and scale the mountains. The proposed panels are curved, providing animation as they interact with the sun to create compelling shadows on the ground plane. 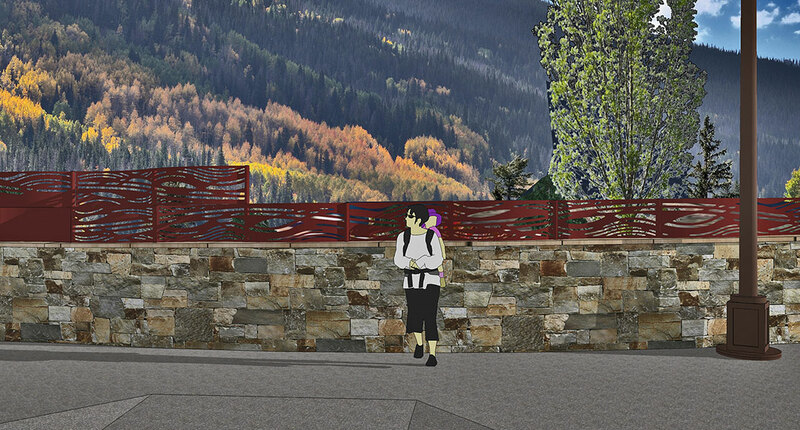 The glare screen is mounted atop the stone clad barrier wall, adding transparency, color and movement to the site. It extends along the entire wall, and doubles in height at the section that requires the glare screen. 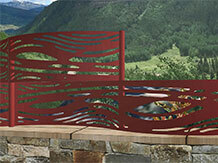 This ribbon of fencing offers a perceptual artful experience, playing with forms, shapes, shadows and movement. As one draws nearer to the walkway, the patterning becomes more pronounced and creates windows to the landscape. 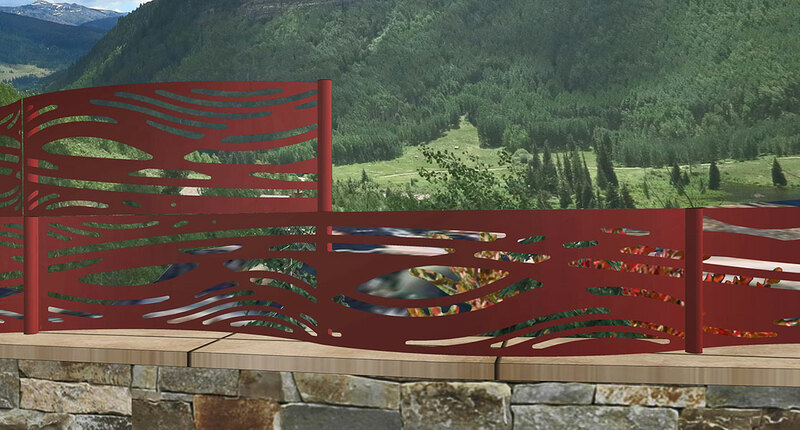 The pattern ribbon and glare screen accent the earth tones and pickup the rust-red hues of the landscape plantings. The two murals reflect the character of the pattern band and glare screen. Their units are twice the size of the pattern ribbon units. The murals work as a pair to frame the central planter and anchor the site. Taken together with the pattern ribbon, they complement the whole, creating a sense of place. The murals introduce a sense of movement and symbolic form to the site. These pattern murals are intended to connect to the site and to each other, enhancing the experience of motion within the site. The light bands of stone bracket the murals and add movement, flowing in the direction of traffic. 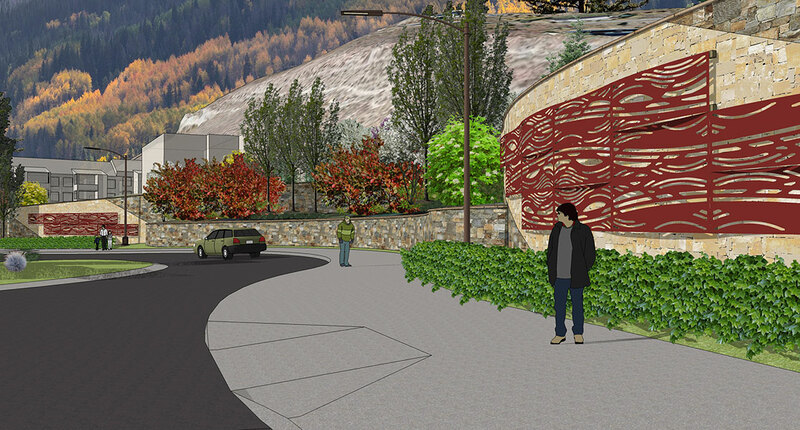 The murals provide landmark forms for drivers and scale and interest for pedestrians. During the day, this site has great light and it complements many views from within the roundabout. The murals will cast a variety of shadows upon the walls behind them.